Need more information about booking Home 7285166 ? 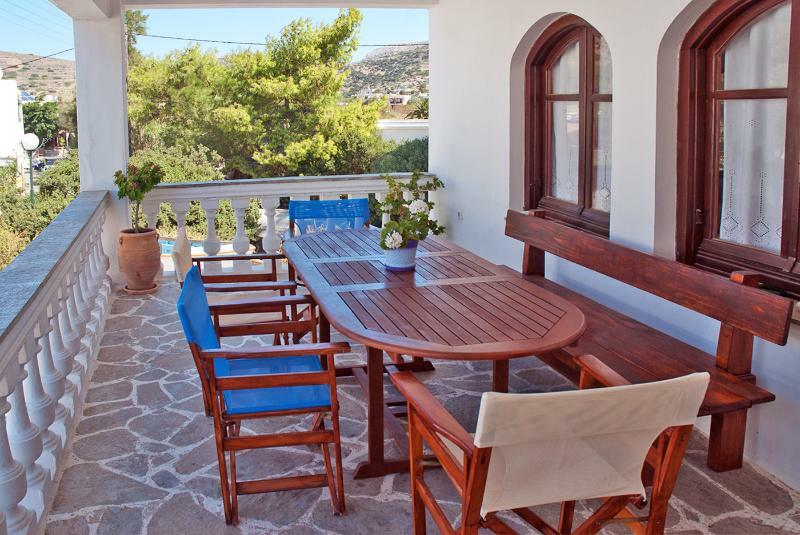 The house is located at Galissas beach, just eight kilometers from the main harbor of Syros island Cyclades. Galissas is one of the most beautiful areas of the island. With the Aegean Sea lying to its feet and the sun setting down into its small bay, the area has one of the nicest beaches in the Cyclades Islands in offer. Apart form the beautiful beach, mini markets, traditional tavernas and trendy bars are all within short walking distance. The house consists of 3 bedrooms with 3 private bathrooms. The first bedroom has a double bed. The second bedroom has two single beds and there is room for a camp bed. The third bedroom has also two single beds. The fourth room is a kitchenette, dining area with a dining table and 2 extra sofa-beds. The house has washing and ironing machine and board and internet access. All the rooms are equipped with TV and air-conditions. There is also a big veranda. The beach is 80 meters from the house and you can go on foot in 3-4 minutes. At the beach there is a volley-ball ground and sea bikes or canoes. You can get in touch with Styliani (the owner) through the contact form on this page. Send Styliani (the owner) an email through the contact form on this page. Alternatively, if there’s a phone number on this page, you can call them. How do I contact Styliani (the owner)? If you’ve already booked, go to Manage your holiday booking to view Styliani the owner's contact details or send them a message. Or send Styliani (the owner) an enquiry through the Contact the owner/manager form if you’d like a quote or more info first. When you pay online through the Book your stay form, a booking request is sent to Styliani (the owner). You’ll find out within 24 hours whether they’ve accepted - no money will leave your account before then. You can also request a quote from Styliani (the owner) through the contact form. The owner will email you the total cost for your dates and a link to book and pay online. Use the Book your stay form to pay provisionally online. You can pay by credit/debit card or PayPal. Styliani (the owner) will have 24 hours to accept the booking and no money will leave your account before then. Why can't I call Styliani (the owner) before booking? You’ll need to contact Styliani (the owner) to do this. Send them a message in Manage your holiday booking or through the contact form on this page. You can request to change the dates or number of people on your booking via the Manage your holiday booking page. To change your holiday dates use the Edit booking button. If you need to change the number of guests staying then send Styliani (the owner) a message. If Styliani (the owner) agrees, they’ll send you a revised quote outlining the changes. You can review and accept/decline this from the Manage your holiday booking page. You’ll have 48 hours to take action before the revised quote expires.